It was the second time I’d stood on the banks of the Vltava River in Prague, watching the Charles Bridge stretch lanterns across the water towards the castle. The stone figures melted in and out of existence through the mist like ghosts and I paused to realise just how far I’d come. Not just the thousand miles from Istanbul, nor the change in career since I’d last crossed these cobblestones. No, I was thinking about my lessons in European history as I’d travelled back and forth across the former iron curtain. Prague, like many of the cities along this Iron Route, witnessed much of this history first hand. While spared the intense bombing that scarred Warsaw, London, Dresden and Berlin, they hadn’t been spared much else. The Nazi Occupation of Czechoslovakia took place before the war even began. Not as a result of direct military aggression, nor the result of a democratic alliance, but as a peculiar act of politics. The Sudetenland area of Czechoslovakia was signed over to Nazi Germany by Italy, France and the UK in the name of something it took me a while to recognise. Appeasement. A crucial part of history we had actually covered in school. Prague and the Cold War. The Backstory. At the time (in 1938) the horror of World War One was recent enough to make many desperate to avoid another Anglo-German conflict yet distant enough for a new generation of soldiers to have arrived. The Anschluss between Austria and Germany occurred with unease – but appeared welcome by the people of Austria. A natural redress, perhaps, of the harsh conditions of surrender drawn up at the Treaty of Versailles. And there were over 3 million Germans living in the Sudetenland of Czechoslovakia after all. And Hitler had promised that after Sudetenland, he would stop. He really would. He just wanted one more piece of fragmented Germany back where it belonged and then all would be well with the world again. Within months, Hitler invaded the rest of Czechoslovakia and then Poland and within the year the world was once more at war. It’s a short and fairly easy walk from the iconic Karluv Most Bridge to Wenceslas Square and only a little further to the golden arches of McDonalds. Upstairs and across from the casino is Prague’s museum of communism. As I passed the Russian Doll with fangs, I realised how seldom I’d heard the ideas behind communism discussed. In the States, the C word seemed unutterable. In Budapest, it stood as a codeword for terror. At home, a plot device for spy thrillers and only in Cuba had I seen its merits explained. Prague’s Museum of Communism stands out from the crowd – by actually talking about communism. For a little while at least, before moving on to how things went wrong. This made interesting background thinking in the quaint cobbled streets of Prague but by the time I left Berlin these interpretations had changed the way I saw the world. The truth is (as is usually the case) that several different people came up with the “idea” of communism, although Karl Marx usually gets the sound bite. This German theologian claimed that the driving force for all of history was the struggle between the classes. Usually, this struggle took place between the current elite and a new elite, two small groups wrestling for power. 1) Marx wasn’t clear about what would happen after the socialist revolution. He theorised that eventually there would be no politics and no need for a state but that in the meantime a temporary dictatorship would be necessary. If ever a man needed to expand on a two word idea, it was Karl Marx and the words temporary dictatorship. 2) Marx remained convinced that only advanced industrial societies could have socialist revolutions; that communism could not and would not work in impoverished agricultural societies simply because history had to follow its logical steps. 3) Communism could not work in one country alone: it needed an international approach. Fast forward to a boy born in the late 19th century whose brother was arrested and executed as a teenager for an alleged plot against the Russian Tsar. This boy becomes the leader of the Bolsheviks who overthrow their monarchy in 1917 and usher in more than seven decades of communism in Moscow. 1) He argued that some people are more politically aware than others and should assume responsibility for leading society to socialism. 2) For practical reasons, a degree of secrecy would be required. 3) He glossed over Marx’s belief that only advanced industrial nations were ready for communism, as Russia itself was still predominantly an agricultural country. Russia, Lenin argued, was the weak link in the chain of powerful capitalist countries. Break the chain here and international capitalism would collapse. Russia would then be absorbed into the new international socialist orbit by countries who were sufficiently developed, such as Britain, France and Germany at the time. 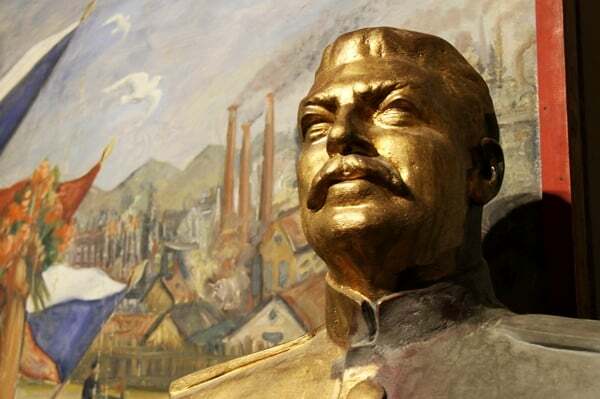 Often depicted as the face of communism, it was Stalin who largely spearheaded the formation of the Soviet Bloc. He was Lenin’s rather controversial successor as the head of the Bolsheviks, a man promoted because he appeared more moderate and stable than his main competitor Trotsky. It’s another one of those historical moments that shriek out from the page like a bloodied exclamation mark. Stalin, as it transpired, was not particularly moderate. He was a driven man who left a complex legacy. His armies freed prisoners from the Nazi concentration camps before themselves constructing monstrous gulags. His policies transformed Russia into a superpower with nuclear capabilities yet left millions dying of starvation. His paranoia and ruthlessness became a prominent feature of communism as it spread worldwide. Stalin signed deals with Hitler, Roosevelt and Churchill and was once nominated for a Nobel Peace Prize. Little of that appears in the Prague museum, privately curated by an American businessman. Here, Marx, Lenin and Stalin are held to account for the deaths of more than 100 million people across the world. It’s a powerful statement, despite its flaws. With that as a backdrop, the museum shows us everyday life in communist Czechoslovakia, from the run-down shops with little to no food to the scarlet stars that young children wore. We see anti-American propaganda and the development of the Socialist Realism art movement. The museum promises a trip through the Dream, The Reality and the Nightmare of communism and it’s to its great credit that it spends time on the first two. The final section recreates the bare-bulbed interrogation desk reminiscent of the House of Terror in Budapest. But whereas that museum faded away after the Stalin years, Prague just keeps on going. It talks about the Prague Spring in 1968, when the more moderate socialist leader in Czechoslovakia tried to ease restrictions. The Soviets responded by invading once more. And then it screams and shrieks its way through the Velvet Revolution, with colour TV footage of the protests on Wenceslas Square. The year when the Soviet Union crumbled and the iron curtain fell. I still can’t understand why. Why the difference? Why the militant repression in the 1960s, yet the almost defeatist disintegration in 1989? It’s late and already past closing time. The women who are working here tonight are already being kind by letting me stay. I grab a few last snapshots of new upon old memories: of high-waisted jeans and bubble gum perms intermingled with police brutality on Wenceslas Square. They’re still in my mind as I head back to the bridge, back to the hotel and past Wenceslas Square. Today, the bloodied and beaten bodies that screamed on these streets are replaced by Christmas Markets and the sweet smell of cinnamon. It’s a disorienting experience. And after Prague, there’s only one more stop left on the Iron Route: Berlin itself, the city that symbolises the Cold War. I take the cable car up to the hotel, watching the modern city of Prague spread out beneath muffled Christmas lights. Great article, a really enjoyable read… Can’t wait for the next installment. Thank you…I’m working on it! Excellent stuff! I wonder if you’re going to be able to convince US folks that communism didn’t actually rise up from the netherworld to take over it all! A great place to pick up on Communism is Cuba though. We spent a few weeks there and it was truly eye opening to see a different life style at work! Great post. Like you, when I went to Prague, I didn’t fully know about the history of Communism and it’s impact on Czech. Your write up has helped me even more, in my understanding. Glad the thread still runs through…It’s going to feel a little strange when I finally reach the end I think! Excellent and informative post. I haven’t been to this museum but would like to go next time I am in Prague. It is such a sad topic for Czechs, and in my experience, the bitterness that many of them still hold can make it hard to learn a lot from them about it. Thank you Jenna. Yes, it’s a sad topic for many – and actually quite difficult to get hold of balanced information on the subject (on either side!) One regret I have is that I didn’t manage to find people to speak to about it when I was there (which in Prague, was only for a very short period of time.) I was much luckier in Berlin – but then again I think that’s a city that has had to confront its 20th century history head-on in a way that perhaps other places haven’t had to do. Well worded summary of Communism. I missed the museum on my visit to Prague. I wish I had managed to go. Learned about the signing between Truman, Churchil and Stalin on a Fat Bike Tour of Potsdam last July. Another good museum with a similar subject is the museum of occupation in Riga. Thanks for the recommendation – I’ll have to look out for it. Thanks for the interesting history lesson. 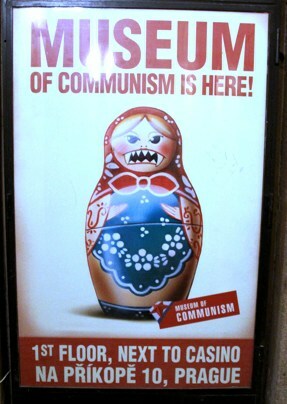 If I ever visit Prague, I will definitely check out the Museum of Communism. Definitely need to check out the museum. I was deeply touched by the history behind the Lennon Wall however. I’ve recently found your site and love the diversity in all your chosen topics and how you write with a sense of narration! This one is a particular interesting topic and I think you’re right about people being ‘hush hush’ about communism due to the atrocities that have taken place under that regime by Lenin, Stalin, Hitler and Mao (I taught English in China, and discovered all my pupils believed Mao to be a Saint! Very scary!). However whilst it’s true to say that Lenin and Stalin are accountable for the death of more than 100 million people, surely to include Marx is inaccurate? Because at the heart of his manifesto is aim to liberate the working class and at the time – the liberation of women, but unfortunately his principles got into the wrong hands…. Personally, I probably would separate Marx from the rest, although several historians claim that Marx had the luxury of enjoying his beliefs without having to wrestle with the inconvenience and pragmatism of putting them into practice. Been reading your blog for awhile now and really enjoyed your narratives and your focus on historical contexts in your travels. Having been to Prague (and to the Communist museum as well while my girlfriend decided that eating fried shrimps at McDonalds was a more enjoyable experience) and Berlin I wished I had read your posts first. Keep up the good work! Thanks Leon. I still find it striking that the McDonalds lives right next door to the museum! Really it’s a nice article.I really enjoyed your topics about the cold war and Prague’s Museum… Thank you for sharing this information with us..